As I leaf through my cookbooks these days, the recipes I end up trying seem to gravitate more toward interesting cooking techniques rather than interesting ingredients. You can especially find this kind of creativity in baking, where vessels for bringing these confections to life can range from the standard pan to a Pyrex mixing bowl (wink). This week, however, I was excited to finally try a technique I've had filed away for a couple months: baking in a coffee can. The recipe comes from a random magazine clipping that was tucked into a recipe box I'd picked up a while ago. It's called pop-up bread, and essentially you make a simple bread dough, let it rise in the can (make sure it's well greased, then you should just be able to pull it out after it has cooled), then pop (ha) it in the oven. The result is a cylindrical loaf of cheesy, savory bread you can cut into cute little rounds (who needs a biscuit cutter?). And now that I've tried this recipe once, I'm imagining all the different flavor combinations to try. 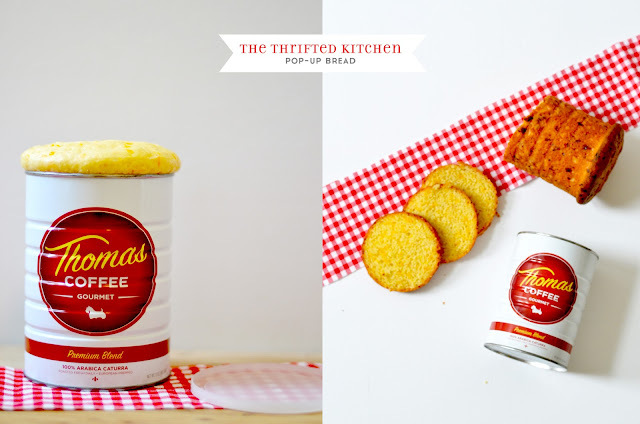 You could also use soup cans to make mini loaves, then serve them to guests while they're still in the can. Wouldn't that be SO cute, maybe with some hearty tomato soup? Or perhaps make some mini grilled cheese sandwiches, using the sliced rounds as the bread? The possibilities seem fairly endless. Probably the most difficult part of the process was finding a company that sold coffee in metal cans anymore. At first, I was going to use one of my vintage ones, but I wasn't convinced I could get the inside clean enough, plus I was pretty sure the only one-pound can I had once housed some sort of chemical liquid. So my quest for a modern metal one landed me with what turns out is a local company called Thomas Coffee, which happens to subscribe to fair trade and eco-friendly practices, so I guess this could also be considered a Sustainable Style post. 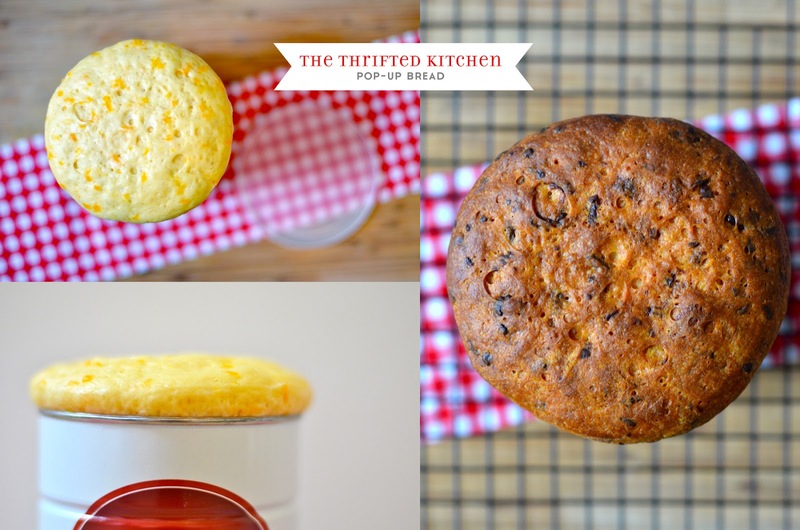 So if you find you've drained your coffee can of the caffeinated goodness inside, be sure and save it so you can try this fun way to bake some bread! Enjoy! Combine 1 1/2 cups flour and yeast. Heat milk, water, oil, sugar and salt until warm (120 to 130 degrees), stirring to blend; add to flour mixture along with eggs and cheese. Beat with electric mixer or by hand until batter is smooth. Using a spoon, mix in the remaining flour (batter will be stiff). 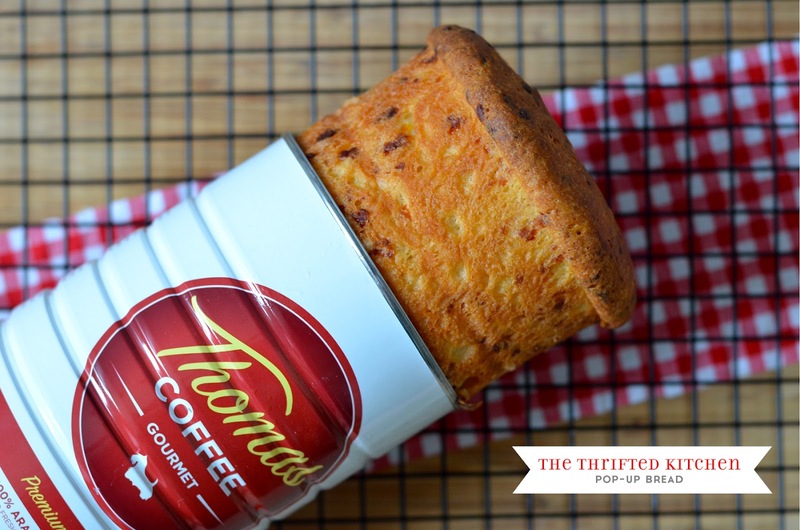 Divide batter and spoon into two well-greased one-pound coffee cans. Cover with plastic lids. Let rise in a warm place until batter is about 1/4 to 1/2 inch below plastic lids, about 45-60 minutes. Remove lids and bake at 375 degrees for 30-35 minutes. Cool for 15 minutes in can before removing, then cool on wire rack. This is fantastic! In all of my vintage cookbook perusing, I've never come across this technique. I'm guessing bread tastes better in cylinder form. Thanks!